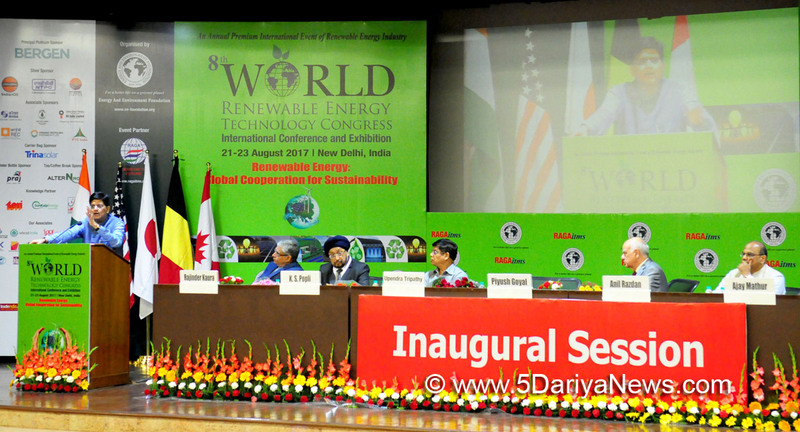 Union Minister of State (IC) for Power, Coal, Renewable Energy and Mines, Piyush Goyal, addressed a distinguished gathering of delegates attending the 3-day 8th World Renewable Energy Technology Congress here today. The Minister also gave away Energy and Environment Foundation Global Excellence awards 2017 during the inaugural session of the conference.The annual conference is visualized and planned in the backdrop of India's vision on achieving "Energy Independence and Power for all by 2022". It focusses on new Green Technologies to ensure clean, reliable and affordable Renewable Energy supplies. It provides an opportunity and open forum to exchange information, share experiences and best practices by bringing together experts, investors and other multi stake holders of i.e. Public and Private Sector, Advisory Groups, Governments, NGOs, Non-Profit organizations Environmentalists and Academia.Addressing the gathering, Shri Goyal noted that the last 10 to 15 years have seen a rapid decline in the quality of the atmosphere due to increasing greenhouse gas emissions globally and it has become probably the largest challenge before humanity today. Fortunately, post the Paris agreement, the world as a whole has recognized that climate change is a serious issue and it needs to be addressed globally in a mission mode, the Minister added. Shri Goyal informed that India is spearheading a number of engagements on the global platform to address the challenge, which include the International Solar Alliance (ISA), the Mission Innovation, global engagements on rapid de-carbonization of the energy space, the African Renewable Energy Initiative, the G20 Energy Ministers getting together to see what can be done to look at a better future for the world, inter alia.Further, Shri Goyal talked about the 3Ds, which today's global engagements need to focus their energy upon. These are - a common shared goal of De-carbonization of the energy space; to look at more Decentralization of energy space; and more and more Digitalization of the energy space. “With each passing day we are running out of time and we need to accelerate our efforts in coordination to promote clean energy and to reduce greenhouse gas emissions. If we do not address to these 3Ds, I am worried that the World might end up decelerating the global economy”, the Minister said.Talking about technological advancements in renewable energy sector, Shri Goyal said, “I am sure this advent of Technology will make renewable energy more attractive particularly for emerging and growing economies like India, especially when renewable energy costs are down as compared to other forms of conventional energy sources”.Other dignitaries present on the occasion were Shri K.S. Popli, CMD, Indian Renewable Energy Development Agency Ltd. (IREDA), Shri Upendra Tripathy, DG, ISA, along with other National and International stalwarts of the Renewable Energy sector.